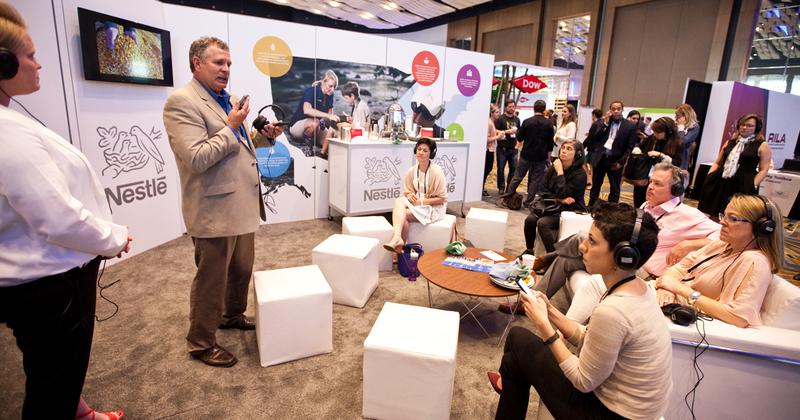 Sustainable Brands® is evolving the concept of the traditional conference expo into an environment fostering inspiration and co-creation. The Activation Hub at SB’18 Vancouver, running June 4-7 at the Vancouver Convention Centre in Vancouver, British Columbia, will bring together 3,000 insightful change makers, entrepreneurs and leading companies to collaborate through the lens of Design Thinking methodology. Concurrent with its world-renowned leadership conference, the Activation Hub at SB’18 Vancouver will leverage Design Thinking, the solutions-focused methodology used by designers in business, to spark ideas around product and service innovation for The Good Life. Attendees, speakers, sponsors and partners will gather in daily Innovation Labs that are facilitated by designers and thought-leaders such as Freya Williams of Futerra, Sally Uren of Forum for the Future, Christina Wong of SustainAbility and James Tansey, associate professor at the University of British Columbia’s Sauder School of Business. Together, these key stakeholders will use the Design Thinking process to break down and collectively navigate key industry sector challenges. An Opening Night networking reception in the Activation Hub co-sponsored by Savers|Value Village and Porpoise. Procter & Gamble (P&G), anchor host for the Good Growth pavilion, will host a conversation alongside Embedding Project and Carrot NewYork around responsible business growth and positive consumption for lifestyle brands. P&G will also be addressing their 2030 goals, driving long-term positive impact on the environment and society – building brands to be a force for good and a force for growth. Living Elements, anchor host for the Good Leisure, Travel, & Entertainment pavilion, will be hosting discussions promoting “sustainability design” for the travel and leisure sector. Nestlé, a premier sponsor of the Good Food Pavilion, will celebrate 10 years of support for honey bees through a virtual reality experience that showcases their efforts to work hand-in-hand with suppliers and grow ingredients in bee-friendly environments. Keurig Green Mountain, partaking in the Good Packaging pavilion, will announce their plan to create 100% recyclable K-Cup pods by 2020 and discuss their partnership with Recycle BC and others to achieve this goal in Canada in 2018 while looking for further ideas from the crowd in support of this ambition. Partner, Recycle BC will be participating in the Good Packaging pavilion as well. LG Electronics, participating in the Good Lifestyle pavilion, will launch their Life’s Good: Experience Happiness Platform. Developed in collaboration with UC Berkeley’s Greater Good Science Center, this platform elaborates on the 6 skills of happiness, and how to use them at home, in schools or in your CSR program. 11 finalists for the Sustainable Brands Innovation Open (SBIO) — a competition for early-stage social and environmental startups — will both exhibit and share their innovations through a series of pitch competitions in the Activation Hub. Unifi, Inc. will station their Repreve truck in the Activation Hub. This interactive, walk-through truck showcases how peat gets turned into recycled materials and gives attendees the chance to win upcycled clothes. The US Farmer and Ranchers Alliance (USFRA) will hold open conversations on best agricultural practices, regulation, and understanding food systems in the supply chain of their products. Their booth will allow attendees to use VR headsets to view an American farm. The Retail Industry Leadership Association (RILA) will host collaborative discussions relating to compliance with environmental regulations within the Good Retail pavilion, open to all RILA members and non-members. Clif Bar & Company will host hikes for conference attendees on the nearby Great Trail, 150km of which Clif is proud to have funded in an effort to connect what is now the longest recreational trail in the world. Clif will feature a Trailhead Basecamp at their lounge in the Activation Hub so attendees can grab nutritional essentials before hitting the trail. Cupanion will launch its #FillItForward campaign where, via the Cupanion app, users can track their reusable water bottle use and donate clean water to those in need. Also focusing on mitigating and tracking single-use plastic is National Geographic, exhibiting in Good Oceans, brought in by sponsor, 21st Century Fox. Vinyl Business Sustainability Council (VBSC), will participate in the Good Materials & Packaging pavilion to discuss the state of affairs in the US vinyl industry, specifically as it relates to building, construction, and water infrastructure applications. Bank & Vogue, in the Good Fashion pavilion, will bring the Circular Economy of Textiles to Life, sharing new initiatives such as reverse logistics, vintage retail, upcycling and remanufacturing of post-consumer apparel, and re-commerce platforms for brands and fiber recycling feedstock supply. Other exhibitors include Salesforce.org, Starbucks, Diversey, EY, LUSH, Intertek, Terracycle, American Forests, Animal Legal Defense Fund, APANA, Canadian Council of Foresters, Eagle Protect, FoodMinds, Green Story, iCompli, Leger, Looptworks, One Tree Planted, The Sustainability Consortium, WAP Sustainability, Water for People, Nice & Serious, Smarter Sorting, TELUS, Makersite, Porpoise, and TIDES. The Activation Hub at SB’18 Vancouver will run Monday, June 4th through Thursday, June 7th at the Vancouver Convention Centre West. Community passes for the Activation Hub, the Opening Night Ceremony and Opening Night Reception can be purchased on the registration page. Learn more at www.SB18Vancouver.com.